This 5 bedroom villa with swimming pool is located in Tambon Kammala and sleeps 10 people. It has WiFi, a garden and barbeque facilities. Kyerra Villa has five bedrooms, on the upper level all are en-suites and have private balconies, one bedroom is in the lower level. A fully equipped western kitchen, outdoor gas BBQ, breakfast bar, separate lounge, dining room, a fifth bathroom and laundry facilities are all located on the main level. The villa's climate control, lighting, Wi-Fi and sound system is all controlled by a state-of-the-art central computer system – including a docking station so guests can enjoy their favourite tunes while lounging poolside. Smart TV's and unlimited Netflix are available in most bedrooms and living areas. Guests may choose to dine in one of three different locations including the formal dining room, breakfast nook or outside patio. This charming and spacious villa encompasses nearly 600 sqm of living space on a 2100 sqm private estate. Rooms on both levels all open to the expansive outdoors which includes one of the largest private pools in Kamala, a Jacuzzi, outdoor sala and a generous, extensive garden for children to run around. The glass doors running the length of the main level all open directly to the pool terrace. All guests of Kyerra Villa will have the space and privacy they need. It also has a games room for the children and a 8ft Pool Table for the adults as well as a ping pong table. Located along the beautiful west coast of Phuket in Kamala, Kyerra Villa offers the perfect luxurious getaway for those looking to escape the hustle and bustle of daily life. 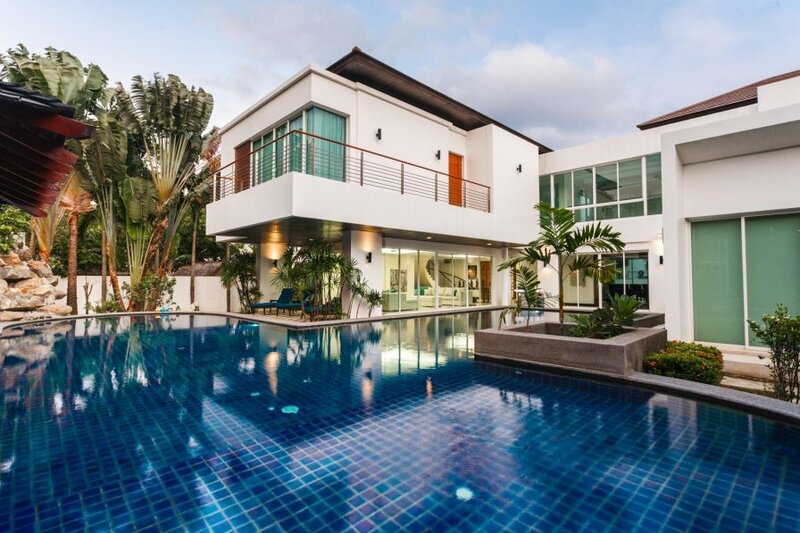 Tailor-made for the discerning family or a group of friends, this luxury villa is located just a short 10-minute walk to Kamala Beach and a short drive to Bangtao and Layan beaches. Nearby 7/11 chain store for basics. Oasis Spa nearby (very upper end, c.3000BHT+ treatments! ), other massage/therapy further down street for 300BHT per treatment. On the main street about 100 metres from the entrance there are several restaurants. There is a larger Big C supermarket on the main road in Kamala. Electric usage 100 kw/day is included, extra will be charged at cost 7 baht per unit. Water usage is included. Cleaning is not included, price is THB 3,000 per cleaning. Please book your cleaning 48 hours in advance.